Urban Studies Abstracts, our featured resource, is a collection of abstracts and trade publications that describe urban planning. Trade publications specialize in a specific trade or industry, while abstracts condense a large amount of research into a summary. This information includes urban affairs, community development, history and urban planning. This collection of abstracts coupled with trade publications means that researchers will find the latest information, all in one place. An abstract is a self-contained, short and powerful summary with keywords that describe the research. Urban studies abstracts discuss the scope, purpose, and results of the research. The structure of abstracts may vary by academic field, but they all have the same goal – to make research easier. Abstracts save the researcher time in addition to providing information about the research. Readers read the summary in an abstract and can quickly decide whether or not to read more. Likewise, online databases use information in the abstract to make it easier to find similar research. Finally, researchers use abstracts to find more research outside of the PSU Library. PSU students, staff and faculty can request items not held by the PSU Library through Summit or Interlibrary Loan (ILL). Summit and Interlibrary Loan allow researchers to request print books and online articles from other libraries, even across the world. Urban Studies Abstracts is one of many sources of urban studies research available through the PSU Library. Urban studies research is usually interdisciplinary, meaning you get more out of your research by exploring other guides and databases for more context. PSU Library’s urban studies resources all focus on a common goal — understanding metropolitan regions, issues, and policies. PSU Library’s Urban Studies Research Guide teachers how to find and use reference sources, government documents, and grey literature. PSU Library’s Urban Studies & Planning Databases lists all of the PSU Library’s databases with information about this topic, making it easy to find them all in once place. PDXScholar also has valuable urban planning research by PSU students, staff and faculty. Please note that some PSU Library resources, including Urban Studies Abstracts, are licensed for use by on-site patrons and current Portland State University students, faculty, and staff. 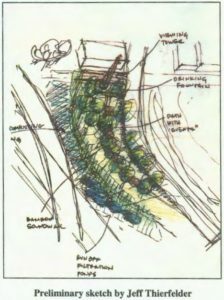 1“Preliminary Sketch by Jeff Thierfelder.” Andreades, Debra; Khan, Arif; Hughes, Emily; and Konkol, Tony, Boise Neighborhood Gateway Project (2003). Master of Urban and Regional Planning Workshop Projects. http://pdxscholar.library.pdx.edu/usp_murp/143, p. 35.